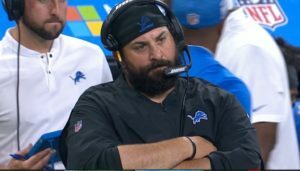 The NFC North has had its share of media coverage this past week with Green Bay quarterback leading a comeback for the ages and new Detroit Lions coach Matt Patricia seemingly losing the dressing room after 1 game of his head coaching career. Week 2 brings together a potential “winner of the division” already in this match up. The highly rated Vikings travel to their rivals to take on a Green Bay team that has no confirmation if star quarterback Aaron Rogers will be taking the field. Rogers went off injured last week against the Bears and then watched as they fell into a 21-3 hole. After getting a medical clearance he returned and subsequently blew Chicago off the field and leading the packers to a 24-23 victory. This week he has not practiced. Maybe the injury is worse then firth thought. Meanwhile the Vikings are building. Last season they won a dramatic playoff game against the Saints however could not push on to the next hurdle. Head coach Mike Zimmer has slowly built a team that competes with his main rival here. If Rogers plays they are 2.5-point favourites – if not the Vikings will be odds on however take Minnesota +2.5 – they could easily win this whether they face Rogers or not. The Monday night football match up sees two teams that are in different spheres of the trajectory. The Seahawks come to Chicago and are potentially on the decline in terms of how they use to dominate the NFC West division. Two consecutive Superbowl’s including a win in 2014 they have started to lose their mana of the tough hard-hitting defensive unit they once were. Quarterback Russell Wilson still can call and run the shots however they have new rivals in their division to contend with. The Bears are in a rebuild phase and new head coach Matt Nagy however they blew a golden chance when they choked against the brilliance of Arron Rogers last week. At home they will be looking to get their season back on track. They have a young team with an exciting offense and are 3.5 favourites here. They should get the win however it will be at the slightest of margins. Take Seattle +3.5 to run them close.